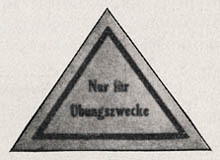 All German ammunition containers bear labels. A knowledge of the practice used in labeling ammunition will enable identifications to be made readily. 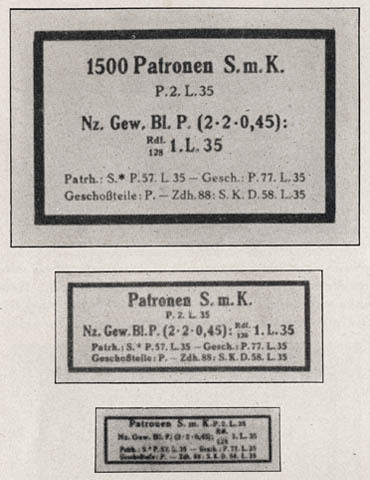 (3) Brick-red labels for blank ammunition. (8) A green diagonal band is used to indicate ball cartridges with the "l.S. ", or light-weight bullet. (9) A blue band of considerable width, running vertically, indicates steel cartridge cases (rather than brass). Figure 86.—"Not suited for overhead fire or firing through gaps in lines!" Figure 87.—"To be fired only in rifles or 98K!" Figure 88.—"To be fired only in machine guns!" Figure 89.—"Only for sighting in." Figure 90.—"Only for practice purposes." 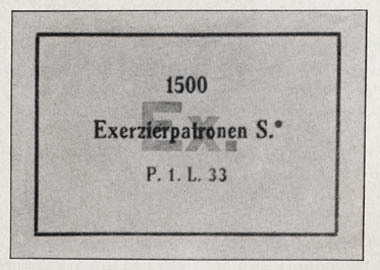 (1) General.—On labels for small-arms ammunition, the Germans omit in nearly all instances any reference to the caliber. 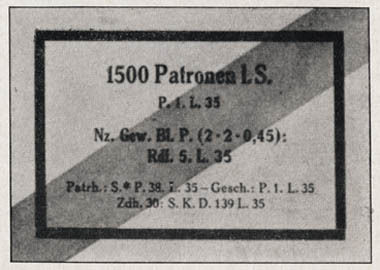 The ammunition cases are labeled to indicate the name of the weapon for which the enclosed ammunition is intended. The standard caliber for pistols and submachine guns is 9 mm. Where the caliber differs from 9 mm, it is shown on the label: for example, Pist. 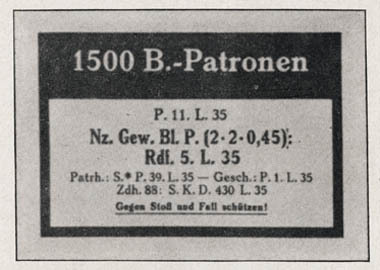 Patr. 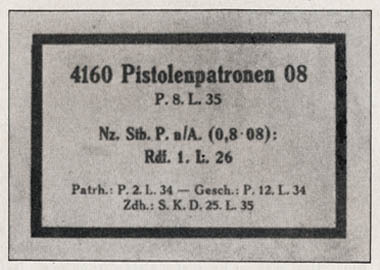 7.63 mm ("7.63-mm pistol cartridges"). Where the caliber of 9 mm is shown on the label, it will indicate that the ammunition is made for use with non-standard 9-mm weapons. 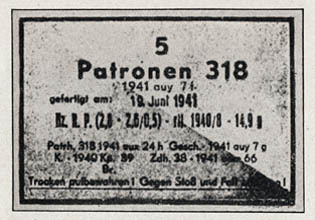 Labels may be expected to contain the following information: (1) number and type of cartridges; (2) lot number and the year of loading of the cartridges; (3) type of powder, and also the type of weapon for which it is intended; (4) place and year of manufacture, (5) specifications of the cartridge case and bullet; (6) specifications of the primer; (7) composition of the tracer (if any). In order to place all this information on a label, abbreviations are used. 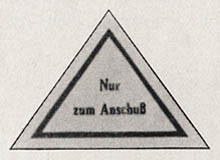 To facilitate the translation of the labels, a list of abbreviations1 and a glossary2 are given in sections VI and VII (pp. 185-190, below) . The Germans use two alphabets, roman and German gothic,3 and consequently labels may be printed in either, or both of them. (2) Examples.—Set forth below (figs. 90 to 101, incl.) 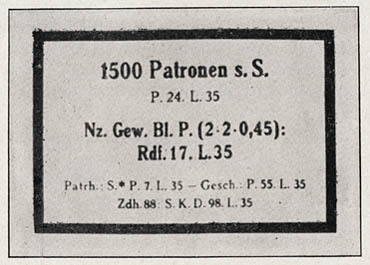 are some typical labels for small-arms ammunition. 1 A more extensive list of German abbreviations is given in "German Military Abbreviations," MIS Special Series, No. 12 (April 12, 1943). 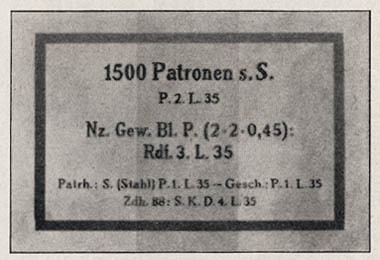 2 See also TM 30-255, "Military Dictionary, English-German, German-English." 3 See figs. 92 and 94.